Meet Sammy Keyes, a young detective, almost too curious for her own good. 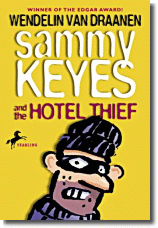 Sammy Keyes and the Hotel Thief is Sammy's first mystery. Bored and stuck in her grandmother's apartment, she watches people from the window through binoculars. While she's focusing on a 4th floor hotel window across the street she sees a man taking money from a woman's purse. Just when the burglar stuffs the money in his pocket he looks up and sees Sammy watching him. What does Sammy do next? She waves at the thief! Should Sammy go to the police or try to solve the case herself? The plot thickens as other characters create problems for Sammy, there's Mrs. Graybill, her grandmother's nosy neighbor, Heather, the school bully, and Officer Borsch, who treats Sammy like a pesky, little kid. Readers will enjoy the story's fast pace and humor as Sammy hunts for clues with her best friend, Marissa. Find out if she can crack the case before the thief finds her!